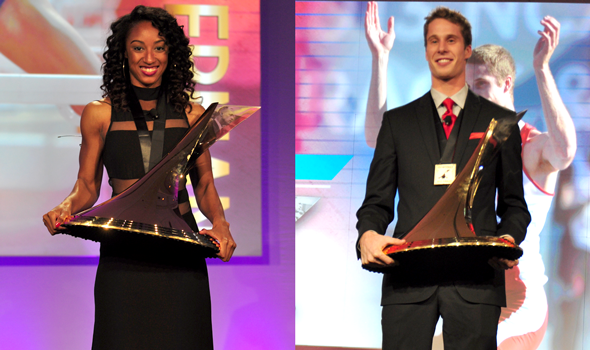 ORLANDO, Fla. – Clemson hurdler Brianna Rollins and Indiana high jumper Derek Drouin were awarded The Bowerman Trophy as the most outstanding collegiate track & field student-athletes of the 2013 season in a ceremony held Wednesday evening at the JW Marriott Orlando Grande Lakes as part of the U.S. Track & Field and Cross Country Coaches Association Convention. Rollins is just the second hurdler to win the award — the first since Queen Harrison in 2010 — and the first from Clemson, while Drouin scored a plethora of firsts for the award. He is the first student-athlete from Indiana and the Big Ten to win the award, and is the first field event specialist to hoist The Bowerman Trophy. The full presentation, which was streamed live by Flotrack.org, can be found here. Having set collegiate records in the 100 hurdles and indoor 60 hurdles with NCAA titles in both, Rollins emerged out of a strong field that included another pair of collegiate record holders in Arizona high jumper Brigetta Barrett and hurdler Kori Carter of Stanford. "Being The Bowerman winner is just icing on the cake," Rollins said of her trophy. "I finished my season with a number of accomplishments and I’m just super thankful. I feel truly honored to be among the former winners." Drouin had to consistently defeat 2012 Olympic silver high jump medalist and rival Erik Kynard for his two NCAA championships in 2013, and he had to surpass equally difficult competition in Arizona’s four-time 2013 NCAA champion distance runner Lawi Lalang and UCLA NCAA champion discus thrower Julian Wruck for The Bowerman Trophy. "I was completely honored to be amongst the finalists here," he said, looking at the finalists and banners of former winners. "To be on the wall with those names is just surreal, and I can’t even picture my face being up there. Those banners on the wall of former winners include decathlon world record holder and Olympic Champion Ashton Eaton, former 1500 meters World Champion Jenny Barringer (Simpson) and Olympic 10,000 meters silver medalist Galen Rupp. Each of the past three women’s winners — Queen Harrison, Jessica Beard and Kimberlyn Duncan — were all on hand to welcome Rollins and Drouin into their exclusive ranks. She is the second woman from the ACC to win the award, joining Virginia Tech’s Harrison from 2010. Rollins bookended her season with an indoor 60 meter hurdles collegiate record of 7.78 in her very first final of the season and kept an undefeated hurdles season going through the NCAA Outdoor Championships. In Eugene, Ore., for the championships, she set the collegiate record twice in the 100 hurdles, including a 12.39 in the final over fellow finalist Carter. She went on to set the American record in the 100 hurdles en route to a U.S. outdoor title at 12.26, and staged an impressive come-from-behind World Championship victory over defending Olympic Champion Sally Pearson of Australia to claim the gold medal in Moscow. Drouin turned in nearly flawless NCAA Championships performances en route to indoor and outdoor national titles, and had an overall record to match with nine wins in nine collegiate events. He won both NCAA titles at heights of 7-8 (2.34m) or higher, and just before the NCAA Championships tied the No. 2 all-time collegiate mark with a leap of 7-8¾ (2.36m) at the Prefontaine Classic. After the collegiate season, Drouin claimed a Canadian Championship and then went on to take bronze at the World Championships with a Canadian record of 7-9¾ (2.38m) in the high jump after claiming the Olympic bronze in 2012.